A Coroner’s Inquest was held on Sunday last, on the dead body of a new born colored infant, found half-buried in a ditch, in a frequented part of the City. The verdict of the Jury was, that the child was born alive, and inhumanely killed by its unnatural mother, a free woman of color, named MARTHA DICKINSON. The North Carolina Star (Raleigh), 29 January 1845. No case involving life was taken up before Wednesday, when MARTHA DICKINSON (a free woman of color) was tried for the murder of her new-born child. The Prosecution was conducted by the Attorney General, and the Defence by C.C. BATTLE, Esq. There was no doubt, from the evidence, whether the child died from violence or neglect, and the Jury, after remaining out several hours, returned a Verdict of Not Guilty! Weekly Raleigh Register, 4 April 1845. Born a slave around 1830 in Granville County, James Harris was freed in 1848. After receiving his freedom, Harris was apprenticed to a carpenter and later opened his own business in Raleigh. Harris left North Carolina prior to the Civil War and attended school at Oberlin College in Ohio for two years, followed by trips to Canada and Africa. In 1863, he received a commission to organize the 28th Regiment of United States Colored Troops in Indiana. (Note: Contrary to the original marker inscription, Harris did not serve as a Union colonel. The text has been rewritten and the marker reordered.) After the Civil War, Harris moved back to his native state as a teacher affiliated with the New England Freedmen’s Aid Society. He became involved in Reconstruction politics and was one of the charter members of the state’s Republican Party after serving as a delegate to the state’s Freedmen’s Convention in 1865. A staunch advocate for the rights of African Americans, Harris sought to provide a voice for equality while maintaining a moderate tone. His philosophy was that blacks and whites had to work together to promote the interests of each race. A gifted speaker, Harris received numerous appointments, including service as a delegate to the state’s 1868 constitutional convention. He was elected a state legislator in the house, 1868-1870, and 1883 and in the senate, 1872-1874. 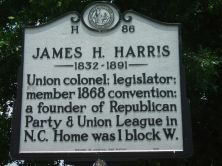 Harris also served Raleigh as a city alderman and as an advocate for the construction of the Colored Institution for the Deaf, Dumb, and Blind. Harris was appointed vice-president of the National Equal Rights Convention in 1865, president of the National Convention of Colored Men in 1869, and vice-president of the National Black Convention in 1877. He attended the 1868, 1872, and 1876 Republican National Conventions, serving as a presidential elector in 1872. Harris edited the North Carolina Republican in the 1880s and pushed for reforms for the protection of laborers, women, orphans and other disadvantaged groups. Harris died in 1891 in Washington, D.C. and was buried at Mount Hope Cemetery in Raleigh. Disgraceful Outrage. – An occurrence took place in this City, on Friday night last, which has excited a great deal of feeling, and will do much towards destroying the deservedly high reputation, which our City has always enjoyed, until recently, as a law loving and law-abiding community. A free man of colour, named Allen Jones, a Blacksmith by trade, who has rendered himself somewhat obnoxious, was forcibly taken from his own house, in the dead of night by a mob, and so beaten, bruised and mangled, that doubts are entertained of his recovery. – Ral. Reg. Tarboro’ Press, 22 October 1842. This marker, originally approved and erected in 1938, was the first one in the North Carolina Highway Historical Marker Program dedicated to African American history. The original sign (depicted in the photograph) was replaced in 2009 by one with a revised inscription. John Chavis, born around 1763 in Virginia, was a prominent free black preacher and educator in and around Raleigh area from 1810 on. Chavis had an extensive education for the time, likely the best education of any African American of his day. He is best known for his classical teaching in Raleigh, educating children of all races. 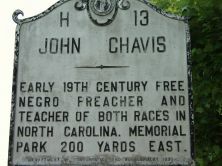 In 1832 free blacks lost many of their rights in North Carolina, and Chavis lost his freedom to preach and teach. He died in 1838, having lived and worked as a respected member of society. Little is known about John Chavis’s early life, but it is thought, based on estate records from 1773, that he may have been an indentured servant for Halifax, Virginia, attorney James Milner. It is also speculated that Chavis received early education from Milner’s classical library under the tutelage of Reverend William Willie. In 1778, Chavis enlisted in the 5th Regiment of Virginia, serving for three years for the Patriots. Honorably discharged, Chavis studied at Washington Academy, present-day Washington & Lee University, and possibly studied privately at Princeton with Dr. John Witherspoon, the president of what was then College of New Jersey. In 1800 he returned to Virginia and was licensed as a Presbyterian minister. Between 1801 and 1807, John Chavis did mission work among slaves for the Presbyterian Church throughout the southeastern United States. In 1809 he moved to Raleigh, where he began preaching as a part of the Orange County Presbytery. It was around this time that Chavis began his school. Chavis’ school accepted both black and white students, widely expanding the options available for the education of free blacks in Raleigh at the time. Chavis taught white students during the day and black students during the evening. Many were from notable families in North Carolina, including future Governor Charles Manly and the sons of Chief Justice Leonard Henderson. Chavis may also have instructed future United States Senator Willie P. Mangum. Following Nat Turner’s Rebellion, free blacks across the south lost their standing as citizens. Chavis could no longer legally preach or educate, and was forced to close his school and retire. In 1833 he published his only written work, a sermon entitled An Essay on Atonement. The work was successful and widely read, and helped to supplement his income during the final years of his life. Chavis died on June 15, 1838. His burial location is unknown, although there is speculation that the grave is on Willie P. Mangum’s former plantation in present-day Durham County.